I have a card today for a sketch challenge over at Simon Says Challenge. This sketch kind of scared me with all its layers and somehow I felt I needed to use patterned paper on the card. If you follow my blog you know I have a fear of patterned paper, it makes me break out in a cold sweat. I remembered I had won a Basic Grey paper pack a long time ago so I decided my card was going to be made from papers in this pack. Instead of starting my card with a stamp I started with papers and then picked my stamp last. Am I happy with the result? Sort of. I like everything except the middle band. If I had to do it over I would pick another pattern for that section. As a side note. The tree stamp is from Sunday International and is called Lone Tree Silhouette. I can't seem to find it online. I love it, Sue, and I think that middle band is what makes your card so interesting. I think you should try this more often! So glad you shared this with us at the Simon Says Stamp challenge this week! Fabulous card, Sue! Great patterns and colors. 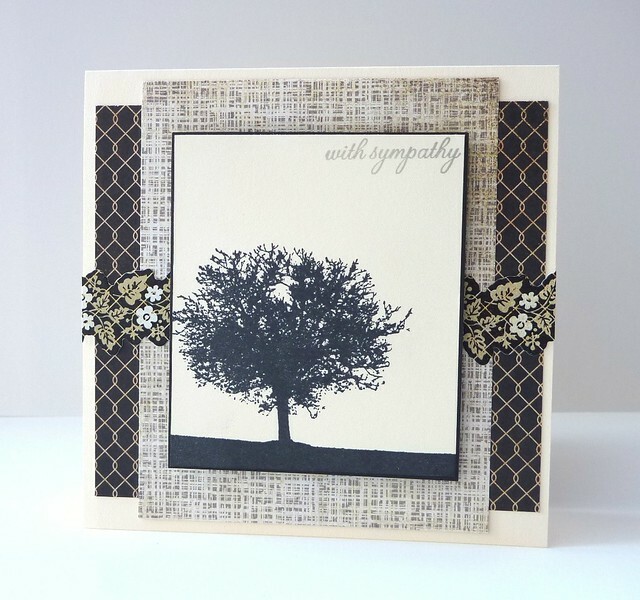 Perfect sympathy card! Thanks for joining us for the Simon Says Stamp Challenge!